During a welcome-back assembly at a rural American high school, Ty Browne, a former student, slips inside the auditorium and locks the doors, trapping everyone inside. When the staff and students realize that something is wrong, he pulls out a gun and starts shooting. The ensuing horror is seen through the eyes of four students, each of whom struggles valiantly to live through the next fifty-four minutes. Unfortunately, not all will survive. He pulls the trigger, and I flinch. The bullet buries itself in the wall beside me. Tyler’s gloating makes me want to charge him. But I refuse to give him that pleasure. 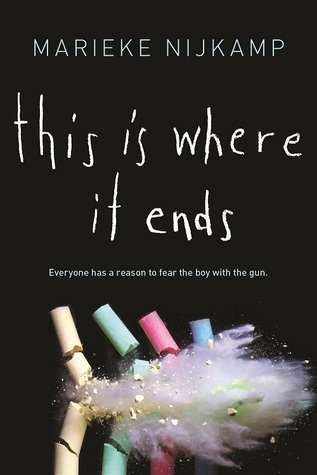 Essentially, This is Where it Ends is a well-meaning, but ineffective tragedy that tries to soften the blows of character loss by leaning on the laws of Hollywood fiction. Recommended for Ages 16-Up.